So you’ve decided to list FSBO and refuse to be coddled, persuaded or tricked into paying the supposedly non-negotiable, typical 6% NYC real estate broker commission. 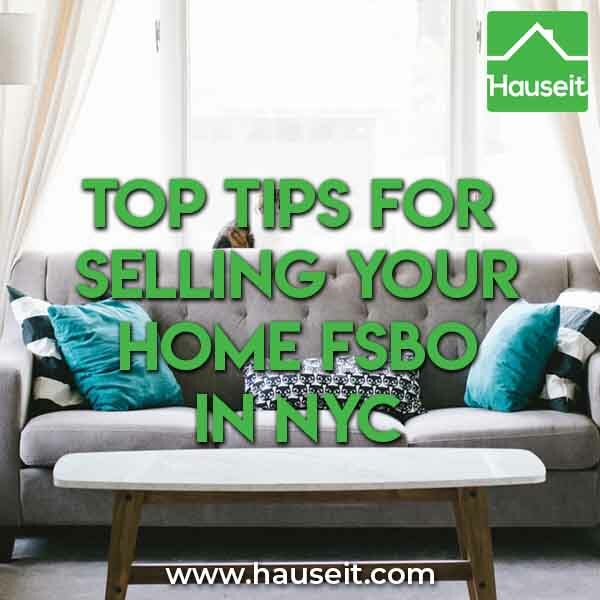 To ensure your success, it’s important you learn all the top tips for selling your home FSBO in NYC. Why Isn’t Everyone Selling Their Home FSBO in NYC? What Happens If a FSBO Seller Has Poor Listing Syndication or Succumbs to Broker Harassment? What Are FSBO Closing Costs in NYC? Why Isn't Everyone Selling Their Home FSBO in NYC? FSBO sellers in NYC have historically not been very successful in the face of fierce resistance from the powerful NYC brokerage industry. For an industry that’s used to earning six percent on one of the highest median sale prices in the world, every additional NYC FSBO seller that succeeds is another threat to the profitable status quo. A NYC FSBO seller’s path to failure is rather predicable, and we’ve written about it extensively on our blog. Among the many reasons why NYC FSBO sellers fail, the two most fundamental are poor listing syndication and broker harassment. Poor listing syndication is a result of a NYC FSBO seller’s failure to properly market to and engage the 75% of buyers who are represented by brokers. Poor listing syndication results in fewer buyers seeing a listing. Due to poor listing syndication, the FSBO seller receives fewer offers and decreases his or her chances of experiencing a bidding war. This fundamental error often results in a FSBO seller failing to sell altogether or selling for a less than optimal price. Broker harassment is another common source of failure among FSBO sellers in NYC. There are over 30,000 real estate agents in NYC, most of which have pretty much zero listings. FSBO sellers are the first target for literally every single agent who needs to find a new client. Armed with insider information about the market, plenty of lies, and years of experience hustling, these real estate agents prey on the fears and lack of knowledge that NYC FSBO sellers have. In an attempt to destabilize the FSBO seller, these agents will throw in some fancy terms (like a REBNY Financial Statement) and spice things up with a few lies in order to make the seller question everything about his/her original strategy of selling FSBO in NYC. Unfortunately, this incessant harassment often results in a FSBO seller thinking that he/she is at fault for a listing not selling even if it’s really just a pricing issue or a photography issue. These vulnerable FSBO sellers eventually cave and agree to hire one of these soliciting brokers and pay 6% commission, only to see their broker reduce the price, order new photos and sell the unit in a matter of weeks. The sad reality is that if the FSBO seller had stood his/her ground and simply reduced the price or ordered new photos on his own, he would have saved 6% in NYC seller closing costs by eliminating the broker fee. 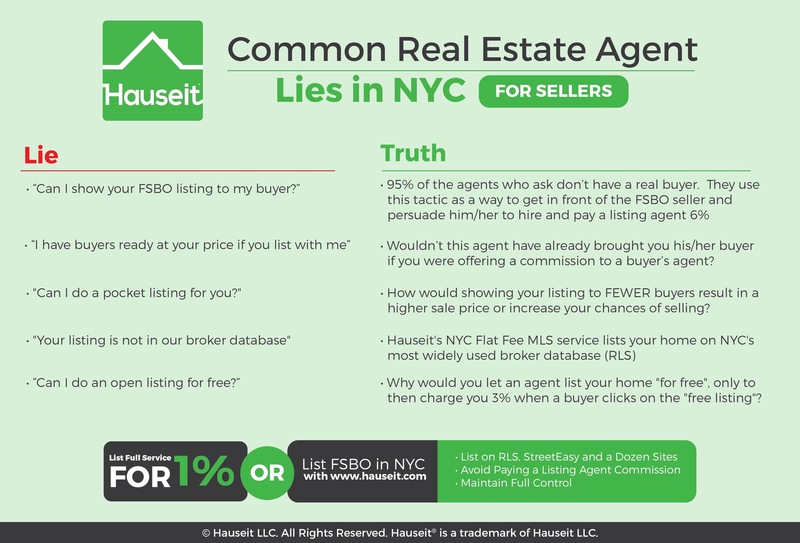 Please review our infographic for some common NYC real estate listing agent lies that FSBO sellers should be on the lookout for. Many of these are common tactics that new real estate agents are taught when they first start in the industry. They range from lying about having buyers who are ready to buy if you list with them, to trying to trick owners into letting them do an open listing for free. Do your research and don’t fall for these all too common lies by NYC’s real estate agents! So What Are the Top Tips for Selling Your Home FSBO in NYC? Fortunately, thanks to Hauseit the odds of success are not as stacked against you as hungry brokers will claim when they cold-call you and attempt to scare or discourage you. The main weapon you’ll need to level the playing field and increase your success rate when selling your home FSBO in NYC is knowledge and exposure, both of which can be had with these little known tips and tricks only seasoned FSBO sellers have learned through painful experience. The purpose of this tip is to reduce broker harassment and teach you how to deal with buyers agents in order to increase your engagement of the 75% of home buyers who are represented by brokers. This first tip for selling FSBO may seem counter-intuitive especially since NYC brokers are notorious for hounding FSBO sellers very aggressively; however, you need to be discerning as to what TYPE of broker you want to avoid and which type you need to encourage. Listing brokers trying to get your business will cold call incessantly and stop by your open house pretending they have a client, but in reality they just want a moment in person to give you their sales pitch. Some of these brokers go so far as to schedule a private appointment to bring their ‘client’ into your home, when in reality this ‘client’ is none other than a fellow broker friend. There is truly no limit to how creative these brokers will be in trying to get your business. After all, taking 6% commission away from you can be a $100,000 payday for them. These agents are pure time wasters and you should filter them out immediately. However, traditional FSBO sellers will have little protection against soliciting agents. It can be almost impossible to filter out real inquiries versus fake inquiries by agents without buyers. How can you tell that a random Yahoo! email address is real or one that was just created by an enterprising agent? The best way to combat this harassment is to list through Hauseit with our NYC Flat Fee RLS (MLS) listing package. Our NYC FSBO listing service reduces broker harassment and increases engagement with buyer’s agents by listing your home with a traditional, full-service REBNY-member agent for zero percent listing agent commission. Because your FSBO listing looks like a traditional, agent-managed listing, you eliminate the time-wasting harassment from agents who are simply trying to have you hire them as a listing agent. In addition, by being listed in the RLS broker database you will increase your engagement with the 75% of buyers who are represented. Therefore, the only brokers who contact you will be legitimate buyer’s agents with real buyers. 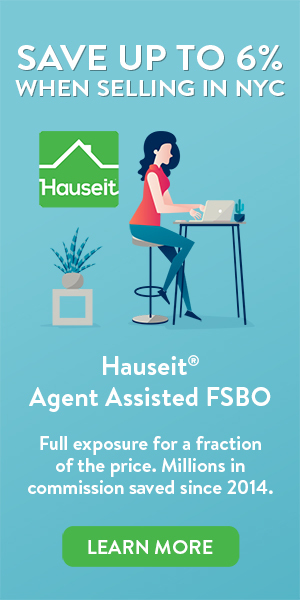 In addition to listing via Hauseit’s Agent Assisted FSBO service, we also suggest getting a “burner number,” which is a disposable phone number you use only for this transaction. You should encourage in your voicemail and listing for people to email you, and if they must call, to leave a voicemail with their work contact information. We suggest also getting a “burner email” that you only use for this transaction so that you won’t be perpetually overwhelmed with broker spam and other unnecessary outreach once you’ve already sold your home. The reason you don’t want to write “no brokers” on your FSBO listing is because doing so will immediately turn away any legitimate buyers’ agents that might have seen your listing. If they do have a buyer and happened to see your listing, they will definitely not show it to their client since you’ve made it 100% clear that you don’t want to deal with brokers which means there’s a 100% chance they won’t get paid if they show your home to their client. FSBO sellers already have a tough time accessing buyers’ agents because they usually cannot access or co-broke on their local interbroker database where buyers’ agents scan for listings by other brokers’ by order of juiciest commission. If you’re selling an apartment in NYC without a broker, the first tip you’ll hear is to make sure you list on the New York Times, Brownstoner or StreetEasy because it’s such a popular website. More clever do-it-yourself home sellers will think that if they list FSBO on Agorafy, Realtor.com or Trulia they’ll have the exact same advertising exposure as a traditional listing agent. Unfortunately, this is a sad and misguided misconception. The reason this is false, despite the self-evident local popularity of the property search portals we’ve mentioned, is that the internet has promoted competition to such an extent that there are now literally hundreds of popular websites which have completely fragmented the home buyer market. No matter how popular one real estate search website is, they will never be able to capture 100% of the unrepresented buyer traffic exactly because of the competition that the internet has helped create. Moreover, even if these clever FSBO sellers manually listed on 100 of the most popular real estate search websites, they would still miss out on the majority of buyers. Why? That’s because they still wouldn’t properly access the 75% of home buyers represented by brokers, and you cannot list your home in your local inter-broker database (RLS in New York City) unless you are a broker. We wouldn’t offer such a dire outlook without offering an equally uplifting tip for NYC FSBO home sellers and telling you how to list your home on the NYC MLS. You can in fact access and list your home FSBO on dozens of popular sites as well as NYC’s broker database (RLS – feeding to Online Residential, Nestio, RealtyMX, and RealPlus) by using a NYC Flat-Fee MLS Listing Package. 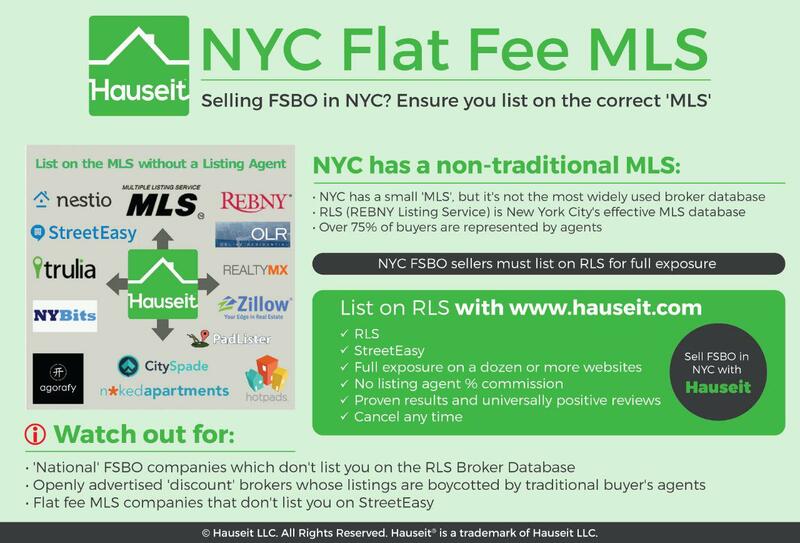 Hauseit will pair you with a traditional REBNY Member Broker who will list you everywhere just as they would for a traditional client, except instead of charging 6% in sales commissions the cost is just a one-time flat fee. The process is owner managed: all inquiries are sent to you so that you can respond and negotiate directly with buyers and brokers. For example, you will be expected to prepare a deal sheet and review buyers’ submit offer form. Before listing your home through an Agent Assisted FSBO, we suggest you understand what level of service you should expect from a flat fee MLS listing. Our NYC FSBO listing service has been so successful that we’ve actually led the growth of the underground FSBO movement in NYC. We’ve all heard horror stories of aggressive broker behavior at NYC open houses, especially when there’s a FSBO owner present. It’s bad enough when brokers ask for a preview with their “client” before an open house, and then show up alone so they can pitch you in person to be your listing agent. What’s worse is when aggressive brokers with no actual buyers show up at your open house or even an open house by appointment only with no intention at all of previewing the apartment for any potential buyers but only to camp out as long as possible to persuade you to list exclusively with them. Sometimes, brokers with some sense of professionalism will leave their card with you and not even tip you off about wanting to list your property or why selling FSBO is hard; however, more often than not these days brokers will literally camp out for the entire duration of the open house and treat it as their office, alternating between harassing your buyers (as they may be potential clients for them on the buy side) and harassing you to list with them. Although you have every right to ask an unwelcome broker to leave and call the police if they refuse, it’s often better to avoid the confrontation in the first place. Fortunately, Hauseit customers listing through an Agent Assisted FSBO or 1% for Full Service listing will avoid these issues. That’s because all of our partner brokers are brand name, traditional real estate firms who never openly discount or tarnish their reputations by openly offering to work for less. Your listing will look just like a regular, full commission listing! In fact, buyers’ agents can only see the commission offered to them in MLS (RLS for NYC). Other agents can’t see what you’ve agreed to pay our partner listing brokers! There’s no need to immediately tip brokers off that you are the FSBO owner, especially when many of them are simply browsing or have clients who are just window shopping. While there’s no need to misrepresent your identity if there’s a real deal on the table, there’s also no need to flaunt your status as the owner upon first contact with a buyer’s broker. If you’ve gotten your home properly listed in the MLS or RLS, then simply let them do their job! There’s no need to confuse them or put doubt in their minds by spewing information about your unique commission structure when they simply want to know if you can show your apartment tomorrow. If you’d rather not have to deal with this at all, you could rent an open house agent or simply list with a full-service agent for just 1% seller broker commission. If you’ve successfully followed our tips on selling your home FSBO in NYC then you’ve already eliminated the largest single part of FSBO closing costs in NYC. This will be the single biggest line item in all the FSBO closing costs you’ll face. NY State charges a 0.4% tax on the sale price. NYC then charges a 1.425% tax on sale prices above $500,000. If your sale price is under $500,000 then NYC will only charge you 1% on the sale price. To summarize, if your NYC property is sold for more than $500,000 then you’ll be levied a total of 1.825% in transfer taxes! If you happen to have a sale price less than $500,000 then you’ll only face 1.4% in transfer taxes. This line item really punches above its weight in terms of value for money among all FSBO closing costs in NYC. Expect to pay between $2,000 to $3,000 on average for a NYC based attorney. You may get quotes for under $1,000 from attorneys who are based in upstate New York or from discounted legal service companies. For complex transactions you may see quotes up to $5,000. Expect to pay half upfront upon execution of an engagement letter and half upon closing. Depending on your relationship with your attorney and the nature of the engagement letter you may be able to only pay the fee once even if multiple buyers back out of a deal and end up wasting your lawyer’s time. Please read our guide on questions to ask your real estate attorney before you interview and hire them! For example, do they have experience with purchase CEMA mortgages? If you are selling a property and immediately buying a new one, you’ll want to know if they have experience with 1031 tax deferred exchange transactions before. This is a major fee that only co-op sellers have the misfortune of having to pay. While the fee itself will vary and some co-ops won’t even have a flip tax, the most common flip tax amount you will see co-op boards charge is 2% or even 3% of the sale price. This tax can vary dramatically, from as little as a small flat fee or 1% of the sale price or as much as 15% of net profits or more. Fortunately, the proceeds from this tax goes back to the building and will be used for the benefit of future residents. It’s interesting that it’s the seller who pays this tax but it’s the buyer who will enjoy the benefit of the additional building proceeds. You’ll face a slew of more minor closing costs all mostly $2,000 and under such as Move Out Deposit and Move Out Fees ($2,000), Managing Agent Fee ($1,000), Bank Loan Satisfaction Fee ($500), Residential Deed Transfer Fee ($75). You can find a complete breakdown of all FSBO closing costs in our comprehensive NYC closing costs guide. Are there any broker fees among FSBO closing costs? Just because you’ve decided to forgo a traditional broker does not mean you can skip out on marketing costs. Fortunately, you have the option to only pay for services you need at cost as a FSBO seller. Upfront marketing costs include professional photography, customized floor plans and internet and print advertising. If you choose to engage the 90% of buyers who are represented by agents, you’ll have to pay a flat fee upfront for a listing in your local inter-brokerage database. Broker fee related FSBO closing costs will be zero unless you sell to a represented buyer. In the very unlikely scenario where a buyer’s agent actually shows your home, he or she will be very careful and will ask you to sign a one-time showing agreement before the showing. The buyer’s broker will ask for 3% commission but this can be negotiated as there really are no rules or protections in place for the broker since your home isn’t listed in your local inter-broker database. This will be necessary to protect the broker from being easily dis-intermediated. The danger to the broker is very real as there are no protections in place. Buyers are free agents and almost never sign any sort of exclusive buyer agency agreement. In fact, having an exclusive buyers agent is extremely rare in New York City. Moreover, FSBO sellers have no pre-existing agreement in place to co-broke (i.e. offer commission) with the wider brokerage community. To make matters worse, because a FSBO listing ad clearly states that the listing is sold by owner, a buyer can easily find the listing online and skip his or her buyer’s agent completely. Given these circumstances, it’s not surprising that buyers’ agents boycott FSBO listings almost completely. The only instance where a buyer’s agent will grudgingly inquire on behalf of a real client is if the buyer has already found the listing and asked the agent for a showing. Even in that case, the buyer’s agent could very well just say it’s not available or say that the owner is unresponsive! Agent Assisted FSBO sellers will face more concrete FSBO closing costs as it relates to paying brokers. Because a specific percentage commission payable to buyers’ agents is listed in RLS, there is no ambiguity as to what is owed if a represented buyer closes on your property. While we cannot advise on what commission rates you should offer, our broker affiliates often state that 3% is the most common commission amount offered to buyers’ agents. Our broker affiliates also say that 2.5% commission is common in RLS as well, and they never receive complaints from buyers’ agents at 2.5% co-broke. However, our broker affiliates have received complaints from buyers’ agents at a 2% co-broke. Some buyers’ agents will flat out refuse to show your listing at only 2% commission. We’ve blatantly heard agents ask whether it can be increased to 3% before they can send the listing on to their buyers. We’ve also heard agents claim that it’s against their corporate policy to show listings with less than 2.5% commission. Quite incredible what prima donnas these bad NYC real estate agents can be!